For Ray Segato, volunteering at Niagara Health's Greater Niagara General Site is a way to give back to the healthcare team who cared for his wife. 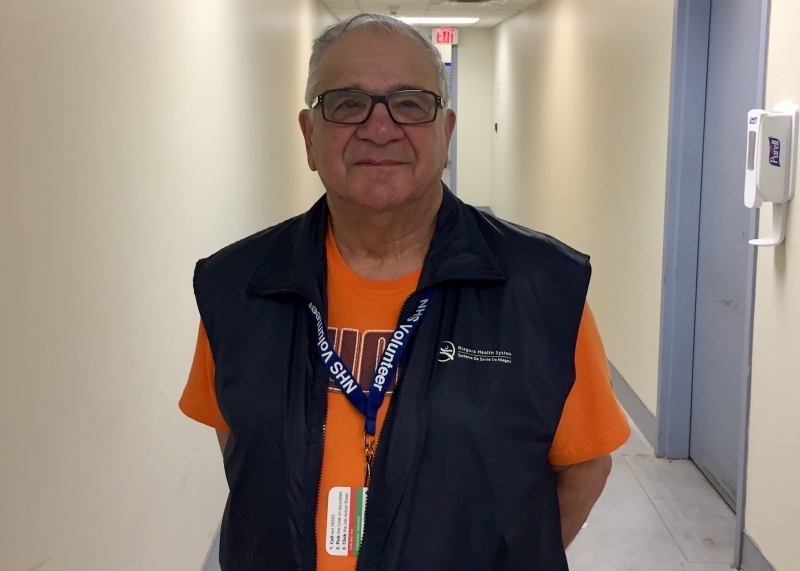 Ray has volunteered in the Niagara Falls Emergency Department since last fall, providing comfort and support to patients and their loved ones. He started volunteering after witnessing the care his wife, Jacqueline, received at the Greater Niagara General Site over a number of years. Jacqueline passed away last April. Ray, 76, says it makes his day to put a smile on someone’s face in the Emergency Department. “It’s comforting for me to know I helped someone,” he says. Another joy of volunteering is interacting with the healthcare team at the Niagara Falls hospital, says Ray. Ray is one of more than 850 dedicated volunteers at Niagara Health helping to provide extraordinary caring to patients and their families. And Niagara Health is looking for more volunteers who have excellent interpersonal skills and enjoy comforting others to volunteer at its sites across Niagara. For more information on volunteering at Niagara Health, please call 905-378-4647, ext 44630, or email volunteer@niagarahealth.on.ca. You can also visit the Volunteer page on the Niagara Health website here. Read a story about Ray in the Niagara Falls Review here.